At Calder Security it’s not just the systems that are secure, we also offer pretty impressive job security. We are a company with a very low staff turnover. Many staff have been here for a number of years including Phil Lynskey who founded the company and then later sold to current MD, Simon Cook (Phil now works as Sales Manager) and Steve Baker the locksmith who has been here since 1987. In actual fact, since Simon bought the company in 2006 nobody has actually resigned; that’s testament to how people feel about working here! While we have of course recruited qualified engineers, something we feel strongly about is our apprenticeship programme: taking on a young person with no experience and training them up to become qualified security engineers. Two members of the team came up through this route and now we have a vacancy for another. 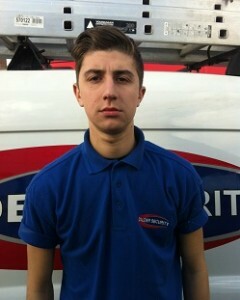 Arran Barton started at Calder Security as an apprentice engineer in 2006, aged 16. He completed a 3 year apprenticeship and on qualification worked on servicing and installation of systems all over the UK. In 2013 his career with the company took a new turn when he was promoted to Contracts Manager. 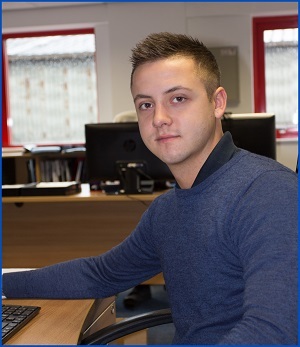 Arran is now responsible for overseeing all contracts and coordinating the engineers. No experience or qualifications are required, just a willingness to learn. A technical mind and an interest in electronic systems would obviously be useful. Apprentices learn on the job, shadowing our engineers and gradually taking on more responsibility throughout their training. We pay a fair wage and on qualification apprentices stay on as security engineers so the long term prospects are extremely good. With only one apprenticeship available every 3 years, this is a rare opportunity to join a fantastic team. Calder Security is Yorkshire’s leading independent security company and still growing year on year.